Publication of this article was funded in part by the University of Florida Open-Access publishing Fund. In addition, requestors receiving funding through the UFOAP project are expected to sumit a post-review, final draft of the article to UF's institutional repository, IR@UF, (www.uflib.ufl.edu/UFir) at the time of funding. The institutional Repository at the University of Florida community, with research, news, outreach, and educational materials. doi:10.1186/1750-1326-7-33 Cite this article as: Gass et al. 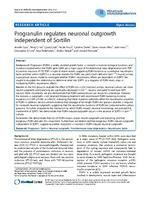 : Progranulin regulates neuronal outgrowth independent of Sortilin. Molecular Neurodegeneration 2012 7:33.
independent of SORT1, suggesting another receptor(s) is involved in PGRN induced neuronal outgrowth. cultures from WT and Grn mice were prepared. specific anti-MAP2 following 10 days in vitro (DIV10). lyzed and repeated in three independent experiments. PGRN). Dosing titers are expressed genomes/mL. omes/mL or 14 ng/mL within the media. is presented as the mean SEM. **p < 0.01; **p < 0.001.
prevents processing of rPGRN into GRNs (Figure 4A). added, the cleavage of PGRN by elastase was inhibited. mouse Pgrn levels, which had yet to be determined. increase outgrowth (Additional file 1: Figure Si). species harbor neurotrophic properties (Figure 4E). C-terminal tag inhibits PGRN's ability to bind to SORT. equally induce outgrowth (Figure 5B). treated cultures. Note that rAAV1-GFP was supplemented in rAAVI-PGRN non-treated cultures. Data is presented as the mean SEM. *p < 0.05; *p < 0.001.
ing PGRN does not use SORT1 to promote outgrowth. increasing time points. Note cleavage of PGRN after only one hour. Data is presented as the mean SEM. **p < 0.01.
their effect on neurite outgrowth in Grnm neurons. remains unclear how this loss leads to neurodegeneration. talized cell lines, and zebra fish embryos [10,11,23-25]. hing. (A) Time course analysis of rPGRN subjected to elastase digest. ints no rPGRN was added, therefore rSLPI blocks endogenous Pgrn. )wth similar to full length PGRN Data is presented as the mean+SEM. L concentrations respectively). Data is presented as the mean SEM. plemented with PGRN via recombinant or viral methods. branching (E,G) in Sortl / and WT cultures with increasing amounts of His-rPGRN treatment. Data is presented as the mean+SEM. mutations lack the ability to promote outgrowth and branching in primary hippocampal neurons. rPGRN-His. Data is presented as the mean +SEM. **p< 0.01; ***p< 0.001.
ing signaling events that promote neurite development. ology can be rescued with exogenous PGRN treatment. suggesting rSLPIs specificity for Pgrn. Van Damme et al. vival and neurite outgrowth in cortical neurons . they may have differential effects . production, stability and patient plasma levels [7,25,32]. Grn mice have been previously I i,. l [27,29]. Animal Care and Use Committee. 0.5 mM GMAX (GIBCO), and gentamicin (GIBCO). munoblotting at a seeding density of 3 x 105 cells/well. and day 7 after media change. PGRN-6His DNA in a 6-well culture plate format. were ip.i,..i to purify the rPGRN protein (Lee et al. each virus was determined by quantitative PCR. I I.....l.... 1.. Invitrogen) diluted in 5% milk-PBS. enzyme reaction was initiated by incubation at 37C. by adding equal amount of 2 x SDS sample buffer. after time zero. A separate reaction with the ii..
frontotemporal lobar degeneration and neuroinflammation. sexual transmission of HIV in Dehong prefecture, Yunnan province. epithelins: roles of SLPI and elastase in host defense and wound repair. determines levels of the frontotemporal dementia protein, progranulin. affect progranulin function and production of mature granulins. frontotemporal dementia recapitulated in progranulin knockout mice. receptors to enhance anterograde transport and neurotrophin signaling.